Hendrix MJC, Kandela I, Mazar AP, Seftor EA, Seftor REB, Margaryan NV, Strizzi L, Murphy GF, Long GV and Scolyer RA. "Targeting melanoma with front-line therapy does not abrogate Nodal-expressing tumor cells". Laboratory Inv., In Press, 2016. Williamson SC, Metcalf RL, Trapani F, Mohan S, Antonello J, Abbott B, Leong HS, Chester CPE, Simms N, Polanski R, Nonaka D, Priest L, Fusi A, Carlsson F, Carlsson A. Hendrix MJC, Seftor REB, Seftor EA, Rothwell DG, Hughes A, Hicks J, Miller C, Kuhn P, Brady G, Simpson KL, Blackhall FH and Dive C. "Vasculogenic mimicry in small cell lung cancer". Nature Comm., In Press, 2016. Hendrix, MJC, Seftor, EA, Seftor, REB, Chao, J-T, Chien, D-S and Chu, Y-W. "Vascular mimicry in cancers: Novel targeting opportunity". Pharmacology and Therapeutics 159:83-92, 2016. Bodenstine TM, Chandler GS, Seftor REB, Seftor EA and Hendrix MJC. 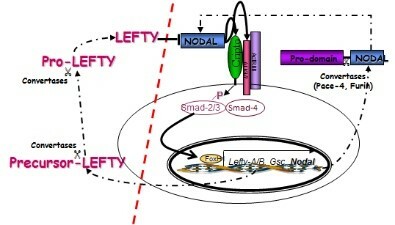 "Plasticity underlies tumor progression: Role of Nodal signaling". Cancer Metastasis Rev 35(1):21-39, 2016. Strizzi L, Sandomenico A, Margaryan NV, Focà A, Sanguigno L, Bodenstine TM, Chandler GS, Reed DW, Gilgur A, Seftor EA, Seftor REB, Khalkhali-Ellis Z, Leonardi A, Ruvo M, Hendrix MJC. "Effects of a novel Nodal-targeting monoclonal antibody in melanoma". Oncotarget. 6(33):34071-34086, 2015. Seftor EA, Seftor REB, Weldon DS, Kirsammer GT, Margaryan NV, Gilgur A and Hendrix MJC. "Melanoma tumor cell heterogeneity: a molecular approach to study subpopulations expressing the embryonic morphogen nodal". Semin Oncol 41(2):259-266, 2014. Seftor REB, Hess AR, Seftor EA, Kirschmann DA, Hardy KM, Margaryan NV and Hendrix MJC. "Tumor cell vasculogenic mimicry: From controversy to therapeutic promise". Am J Pathol 181(4):1115-1125, 2012. Our laboratory is a cancer biology laboratory that utilizes functional assays coupled with biochemical and molecular analyses to dissect and identify the proteins, molecules and signaling pathways associated with the aggressive cancer cell phenotype. Our methodology utilizes a comparative approach between aggressive and poorly aggressive cancer cells (with melanoma being our primary model), or comparison to "normal" cells when available. Our group found that aggressive cancer cells can form vasculogenic-like fluid conducting networks when grown in three-dimensional matrices in vitro that in vivo can contribute to tumor perfusion and metastasis. These networks can be seen in patient aggressive melanoma, breast and prostate cancer, as well as other cancers. complex formed by the aggressive cells. More recently, we found that aggressive cancers can re-express the embryonic morphogen Nodal, a TGF-β signaling molecule that contributes to maintaining pluripotency and is associated with stem cells, but do not re-express its primary inhibitor, Lefty. Since cancer stem cell populations are associated with drug resistance and recurrence, this observation suggests that Nodal expression and signaling have the potential to be both a diagnostic marker and therapeutic target for aggressive cancers that become resistant to conventional front-line therapies. In short, Nodal signaling has been shown to underlie the cancer stem cell phenotype, upregulate tumor growth and metastasis, and its expression associated with resistance to conventional drugs. Aggressive human tumor cells re-express the potent embryonic morphogen, Nodal, but not its primary inhibitor, Lefty, which is expressed and regulated by Nodal in human embryonic stem cells. Re-expression of Nodal in aggressive cancers is associated with the cancer stem cell phenotype, an upregulation of tumor growth and metastasis, and drug resistance.